The curious thing about this image is that it looks so much like an over-the-top film set. The dictator looks down on the hurrying-past public, from the facade of the Party HQ. Which in this case is imaginatively, yet also somehow absurdly, covered in graffiti - in the original sense of writing or drawings that have been scribbled, scratched, or painted. The 'Si, si, si' is of course Italian for 'Yes', which is actually not so sinister. The occasion was the the 1934 elections, in which Italians were called to vote either For or Against the Fascist representatives on the electoral list. Indeed, the facade was not always covered up like that. In 1934, Mussolini had already ruled Italy for 12 years, and the election had certain fascistic features: there was only one party - the fascist one - and the ballot slip for 'Yes' was patriotically printed in the colours of the Italian flag (plus some fascist symbols), while 'No' was in fine philosophical sense a vote for nothing, and the ballot sheet was empty white. The setting of the picture is the Palazzo Braschi in Rome, and the building was the headquarters of the Fascist Party Federation - which was the local one, not the national, Party headquarters. According to the Fascist government that supervised the vote, anyway, the eventual vote was a massive endorsement of Il Duce with the Fascist list being approved not merely by 99% of voters but by 99.84% of voters! But back to the building. 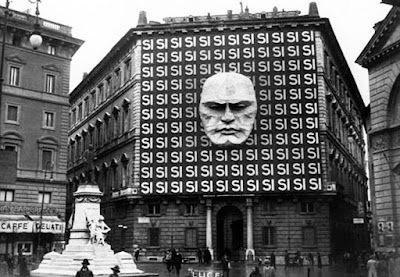 Part of Mussolini’s and his philosopher guru, Giovanni Gentile's, grand scheme was to transform the cities into theatrical stages proclaiming Fascist values. Italian fascism is little understood, and was not identical to the later Nazi ideology - but one thing it did share was the belief in totalitarian power. As George Orwell would later portray in his dystopia, 1984, in this new world 2+2 really would equal five if the government said so. Si! The menacing face of Il Duce glaring threateningly down at the passing public makes me wonder who made up the 0.16% of the population that bravely ‘voted for nothing’—the empty white portion of the ballot sheet. With a tinge of irony, minus the sinister glare on campaign headquarters, the voting public in many campaigns today might actually embrace the option to vote for ‘nothing’—to send a message of disdain to their candidates. Unfortunately such (lesser) tyrants still abound, whose philosophies don’t venture too far from Benito’s: “For fascism the state is absolute, individuals and groups relative”. With that sentiment rattling around your head, you can never say ‘si, si, si’ too often—especially with a jackboot on your neck. The need for ‘theatrical stages’ would seem to suggest factors at play beyond what we most basically think of as totalitarianism. Mussolini himself preferred the term 'corporatism' over 'fascism'. This being the case, we have (had) it in various countries very familiar to us. Which is to say that this may be about 'us' as much as it is about 'them totalitarians'. I myself experienced an election in which an apartheid government obtained more than 80% of the vote. But how? That, I think, was a complex scenario. I should have said, more than 80% of the seats in parliament. A great picture! It should be award-winning, but should it or the original painting be awarded? One other thing that is interesting is the "For or against" question, because it is oddly similar to this year's election in the US. The question being: "For or against Trump"? With Clinton representing the empty choice, or politics as usual. Yes, well put. The Legend (Perig) returns. Indeed. The Uk vote on the EU, which has thrown the UK into uncharted waters, was very much like this: 'Leave' or 'Remain'. The very choice of word' remain' is dispiriting, negative... reeks of decay! Yes, Perig, you’re right. It’s been a surreal campaign, with both Trump and Clinton scoring markedly higher ‘unfavourable’ than ‘favourable’ ratings, based on the average of polls. Not an insignificant fact! Especially given that the third-party alternative lacks traction—doubly so following a series of gaffes. The two camps—those for and against Trump and Clinton—base their respective stands on diametrically different grounds. Two alternative universes that come nowhere near touching. Meanwhile, Trump, and his particular brand of ardent populist appeal, has proven difficult for TV’s talking heads to figure out, starting with the early days of the primaries. What were thought to be deal-breakers weren’t. Yet the pundits didn’t stop talking. Clinton’s equally ardent supporters feel her plank promotes knowable, compatible center-to-left policies. But the policy stuff aside, what sullies the picture is the visceral dislike and distrust both sets of supporters have for the other’s candidate. Slogans abound. Antipathy abounds. Identity politics seeps in. Words that make Orwell proud. Conventional wisdom refuses to surrender. And all remains irreconcilable—until the morning after November 8, that is. When we can sit down and have a nice breakfast. If you are looking for the differencies between fascism and nazism, I would like to suggest some artistic sources - often art says more than anything else. -) A documentary of Pier Paolo Pasolini titled "La forma della città" [The form of the city], that he concludes saying "The fascist regime was nothing but a group of criminal at the power. In reality, they did nothing, they they have completely failed to do anything, they did not change the reality of Italy...". I believe that things are very different with nazism (if you understand Italian: http://www.teche.rai.it/2015/01/pasolini-e-la-forma-della-citta-1974/). -) A comedy titled "I due colonnelli" [The Two Colonels] (https://en.wikipedia.org/wiki/The_Two_Colonels). Thank you Federico. A professor of mine said that philosophy is first reflected in art, then music, then general culture, then theology.